Food Costs > How Much Do French Fries Cost? How Much Do French Fries Cost? French fries, also referred to as “chips” in some places, are one of the most common foods in America. Fries are made by cutting potatoes into long sections and then deep frying these pieces in oil. Fries can be ordered from almost any restaurant and can also come in different varieties. For example, waffle fries, which are larger and look a waffle; steak fries, which are cut wide and thick; sweet potato fries, which are made from sweet potatoes; or shoe string fries, which are cut very thin. French fries can also be seasoned in many different ways. Some restaurants have their own special seasoning recipe while others may simply season with salt. Finally, there are some french fries that still have some of the potato peel while others are free of the peel. This variety of fries is one of the things that draws people to them. On average, French fries at a fast food or a restaurant will cost anywhere from $1 to $4. For example, French fries from fast food chains, such as McDonald’s and Burger King, cost around $1 to $3. Depending on the state you are in, the price per bag of fries could be higher due to the local cost of living. At the grocery store, most bags of frozen bags of french fries will range anywhere from $2 to $5 per bag. This will depend on the brand and where you purchase it from. At Walmart, for example, a 32-ounce bag of Ore-Ida retails for a pinch less than $2.50. In bulk, the costs can be closer to $20 to $25 for a 30-pound box or about $0.75 to $1 per pound on average. For instance, at Sam’s Club, they sell a 30-pound bag of straight cut fries for about $20, depending on your location. At a fast food chain, they are usually sold in small, medium, large and extra large bags or cups. As from frozen French fries, they should come in sealed pouches and can be a different weight as well. 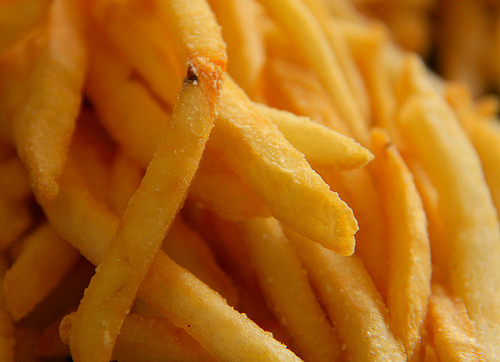 Packed fries can often come in 24 or 32-ounce quantities. If purchased in bulk, they will often come in a sealed box. Most of your frozen french fries, unless specified, will be made from Grade A potatoes and will simply need to be baked in the oven or thrown into a deep fryer. Aside from your regular French fries, there are quite a few varieties, including carne asada, cheese, chili, crinkle-cut, curly, curry, oven, waffles, wedges, poutine, shoestring, steak and sweet potato. Consider making french fries on your own. In most cases, all you will need is a bag of potatoes, some frying oil and sea salt. All of these ingredients, when combined, should easily cost you less than $1 per serving. Refer to this Food Network recipe for an easy recipe.